Virginia A. Stevens, 82, of Blowing Rock, North Carolina died December 6, 2017. Born Lydia Virginia Raleigh Storr Atkinson in Chicago, Illinois to George Brahnam and Lydia Virginia Raleigh Storr Atkinson, she grew up in Northfield, IL. Throughout her childhood, she spent many happy times with her mother's family in Raleigh, eventually living in North Carolina for more than 50 years. She graduated from Duke University in 1957 with a BA in Education and was active in Student Government, the Women's Housing President's Board, Kappa Kappa Gamma sorority, and was a member of the White Duchy. After graduating, she returned to suburban Chicago; taught elementary school in Winnetka, IL; and travelled to Europe for several months before marrying David H. Stevens on December 19, 1959. She met him while at Duke, where Dave was a fraternity brother of her twin brother "Budge." Ginny was deeply dedicated to service, preservation and education. Throughout her life she received many recognitions and awards, but she did so much more quietly and privately-and she would have had it no other way. In Raleigh, she served as a Board Member and President of the Mordecai Square Historical Park, the Historic Preservation Foundation of North Carolina, and the YWCA of Wake County. She was a founding Board Member of the North Carolina Quilt Symposium and was also an active member of St. Michael's Church, the Raleigh Fine Arts Society, the Coley Forest Garden Club and the 1789 Questers International. 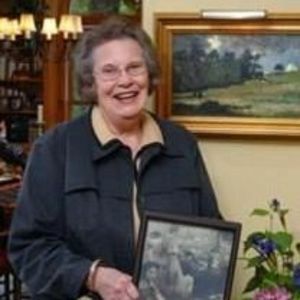 During the years when she transitioned from living full-time in Raleigh, her passion for serving the community shifted to her beloved Blowing Rock where she was the Co-founder and President of the Blowing Rock Historical Society. She served on the Board of Directors for the Blowing Rock Art and History Museum (BRAHM), Edgewood Cottage Restoration Committee and Edgewood Cottage's Artists in Residence Program, and the Blowing Rock Community Art Center Foundation. In 1994 she organized the move and saving of the historic Hayes House. She also worked to publish 4 books: Green Park Historic District; Post Cards of Historic Blowing Rock, Volumes I and II; and The Architectural History of Watauga County. She served as Chairman of Concerned Citizens and also wrote many articles and consulted in areas of preservation and development, including the renovation of the historic Green Park Inn prior to its reopening in 2011. Several of the awards that recognized her contributions include: The Ruth Coltrane Cannon Cup (State of North Carolina, 1996), Rotary Citizen of the Year (Blowing Rock, 2001), Woman of the Year in Blowing Rock (2001), and the Woman of the Year Award for the High Country (2011). On December 5, 2010 she received the State of North Carolina's Order of the Long Leaf Pine Award. Her heart for service was exhibited in her support for the Blowing Rock Community Foundation, the Town's annual Hometown Harvest Supper, and working with and serving the people of Blowing Rock where she was often called "Mrs. Blowing Rock." She was honored as Grand Marshall of the 4th of July Parade in 2016. She spent the last 18 months of her life in care at The Pines, Davidson, where her love and kindness was reciprocated by The Pines' staff as she was lovingly cared for during the last, challenging months. She enjoyed the calls, cards, and visits of many friends and she loved many of her friends as extended family members. Ginny is survived by her husband of almost 58 years, David H. Stevens; her daughter Leslie Stevens Bulluck (Andy) of Glencoe, IL; her son David H. Stevens, Jr. of Raleigh; and her beloved grandchild Lydia Virginia Linmei Bulluck, who affectionately called her "Big Lyd." She is also survived by her sisters-in-law Martha Vaughan Atkinson and Ann Stevens Albert; three nieces; 2 nephews; as well as 2 great-nieces and 3 great-nephews. Her parents, her Aunt Emily Storr Fulford, and twin brother George Brahnam Atkinson, Jr. predeceased her. Visitation will be held at the Brown-Wynne Funeral Home, 300 Saint Mary's St., Raleigh on Tuesday, December 12, 2017 at 10:00 am; a memorial service will follow at 11:00 am at the same location. Interment will immediately follow at Montlawn Memorial Park. A reception will be held in Blowing Rock on Thursday, January 4, 2018 from 4:00 pm - 6:00 pm at the American Legion Hall, 333 Wallingford Rd. In lieu of flowers, memorial donations may be made to Blowing Rock Historical Society, P.O. Box 804, Blowing Rock, NC 28605.